Proper disposal of human waste is important to avoid pollution of water sources, avoid the negative implications of someone else finding it, minimize the possibility of spreading disease, and maximize the rate of decomposition. In most locations, burying human feces in the correct manner is the most effective method to meet these criteria. Solid human waste must be packed out from some places, such as narrow river canyons. Land management agencies can advise you of specific rules for the area you plan to visit. Contrary to popular opinion, research indicates that burial of feces actually slows decomposition (at least in the Rocky Mountains). Pathogens have been discovered to survive for a year or more when buried. However, in light of the other problems associated with feces, it is still generally best to bury it. The slow decomposition rate causes the need to choose the correct location, far from water, campsites, and other frequently used places. Catholes are the most widely accepted method of waste disposal. Locate catholes at least 200 feet (about 70 adult steps) from water, trails and camp. Select an inconspicuous site where other people will be unlikely to walk or camp. 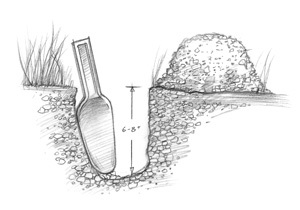 With a small garden trowel, dig a hole 6-8 inches deep and 4-6 inches in diameter. The cathole should be covered and disguised with natural materials when finished. If camping in the area for more than one night, or if camping with a large group, cathole sites should be widely dispersed. they are easy to dig in most areas. they are easy to disguise after use. they disperse the waste rather than concentrate it (which enhances decomposition). it is usually easy to select an out of the way location where you can be certain no one is going to casually encounter the cathole. Select a cathole site far from water sources, 200 feet (approximately 70 adult paces) is the recommended range. Select an inconspicuous site untraveled by people. Examples of cathole sites include thick undergrowth, near downed timber, or on gentle hillsides. If camping with a group or if camping in the same place for more than one night, disperse the catholes over a wide area; don’t go to the same place twice. If possible, locate your cathole where it will receive maximum sunlight. The heat from the sun will aid decomposition. Choose an elevated site where water would not normally go during runoff or rain storms. The idea here is to keep the feces out of water. Over time, the decomposing feces will percolate into the soil before reaching water sources. A small garden trowel is the perfect tool for digging a cathole. Dig the hole 6-8 inches deep (about the length of the trowel blade) and 4-6 inches in diameter. In a hot desert, human waste does not biodegrade easily because there is little organic soil to help break it down. In the desert, the cathole should be only 4-6 inches deep. This will allow the heat and sun to hasten the decay process. When finished, the cathole should be filled with the original dirt and disguised with native materials. A cathole is the most widely accepted means of waste disposal in arid lands. Locate catholes at least 200 feet (about 70 adult steps) from water, trails, and camp. Avoid areas where water visibly flows, such as sandy washes, even if they are dry at the moment. Select a site that will maximize exposure to the sun in order to aid decomposition. Because the sun’s heat will penetrate desert soils several inches, it can eventually kill pathogens if the feces are buried properly. South-facing slopes and ridge tops will have more exposure to sun and heat than other areas. Though catholes are recommended for most situations, there are times when latrines may be more applicable, such as when camping with young children or if staying in one camp for longer than a few nights. Use similar criteria for selecting a latrine location as those used to locate a cathole. Since this higher concentration of feces will decompose very slowly, location is especially important. A good way to speed decomposition and diminish odors is to toss in a handful of soil after each use. Ask your land manager about latrine-building techniques. Use toilet paper sparingly and use only plain, white, non-perfumed brands. Toilet paper must be disposed of properly! It should either be thoroughly buried in a cathole or placed in plastic bags and packed out. Natural toilet paper has been used by many campers for years. When done correctly, this method is as sanitary as regular toilet paper, but without the impact problems. Popular types of natural toilet paper include stones, vegetation and snow. Obviously, some experimentation is necessary to make this practice work for you, but it is worth a try! Burning toilet paper in a cathole is not generally recommended. Toilet Paper in Arid Lands: Placing toilet paper in plastic bags and packing it out as trash is the best way to Leave No Trace in a desert environment. Toilet paper should not be burned. This practice can result in wild fires. Proper disposal of tampons requires that they be placed in plastic bags and packed out. Do not bury them because they don’t decompose readily and animals may dig them up. It will take a very hot, intense fire to burn them completely. Urine has little direct effect on vegetation or soil. In some instances urine may draw wildlife which are attracted to the salts. They can defoliate plants and dig up soil. Urinating on rocks, pine needles, and gravel is less likely to attract wildlife. Diluting urine with water from a water bottle can help minimize negative effects. Special Considerations for River Canyons: River canyons often present unique Leave No Trace problems. The most common practice is to urinate directly in the river and pack out feces in sealed boxes for later disposal. Check with your land manager for details about specific areas.